Whether you're a guy or a girl, at the pool, at the beach or on stage, your abs are the first place people look to tell how fit you are. Abdominal muscles are the true marker, the core of fitness. We walk you through two ab circuits to help you achieve that toned, hi-def 6-pack. One circuit is designed to build your abs, and the other is designed to tighten your abs. We recommend incorporating these circuit workouts 3-to-4 times per week into your existing workout routines, alternating the workouts, building first and toning second. The goal is to keep the intensity high, elevate your heart rate elevated and really get that extra burn. Set up all four exercises before you begin to increase efficiency and intensity. *Alternative For Beginners: Start on your knees, instead of standing. *Maybe your gym doesn't have ankle straps. Follow the link and get a pair of straps from the Bodybuilding.com store! 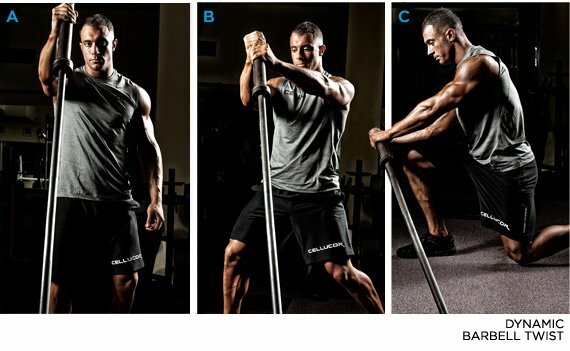 *For Beginners: Alternative Seated Barbell Twist. *For Beginners: Don't use a plate. Drop the weight and you gradually work back up to it as you build your abs. This circuit will involve more reps, some drop sets, a lot of focus on toning your abs rather than building them. High reps are going to help you tighten your abs while burning calories. This is another 4-exercise circuit with 1-minute rests between the three circuits. Make sure to set everything up first, to limit your rest periods between exercises. *Start with Finger-to-Toe touches; as soon as it gets difficult, switch to Elbow-to-Knees. * Go back and forth as quick as you can! Your abs are probably on fire! That's the key to getting hi-def abs. First comes the Build Circuit, followed by the Tightening Circuit. We recommend hitting the circuits on alternating days: Build, then Tighten ... for a total of 3-to-4 workouts per week. Make sure you have your strength training, your cardio, proper supplementation and your meal programs keyed-in to get hi-def abs. For more information on that, check the links below. For more articles and videos, tips and tricks to achieving hi-def abs, visit Bodybuilding.com.